Absolutely no expense was spared in the construction of these beautiful facilities. Just kidding, there is absolutely nothing architecturally interesting or particularly nice about this hallway. If anything it stands as a monument to the bare minimum level of facilities construction and maintenance that our mentally ill were subject to in the 20th century. 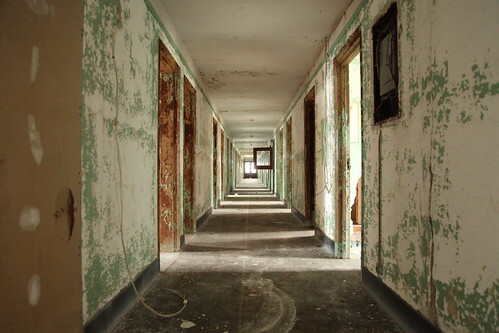 On the other hand, with all the doors open, and all the windows open, it is rather bright inside for a mental hospital with no electric service.